Academics and corporate giants are fond of saying small businesses simply need to change their business model when a corporate competitor moves into their territory. That’s not so easy for a small-business owner who has spent years building up a local client base. Often, a better alternative to changing businesses or moving is to expand the existing business into new markets. Gentrification, as Abigail Savitch-Lew of YES! Magazine, recently covered, can change the demographics of a neighborhood in a matter of years. To reach a new and probably younger demographic, business owners can turn to social media, and most of the tools needed to create an online presence for a business are free. Geo-marketing at a very simple level is a way to attract local prospects to a business. Without even delving into search engine optimization for a business website, as Kissmetrics discusses, a shop owner can increase brand awareness by using social media platforms such as Yelp, Foursquare, Google+, Twitter, Instgram and Facebook. Depending on what a business is selling and its target customer, some social media platforms are better than others. If the brand has a visual product, Instagram or Pinterest might be best. If the shop is a restaurant, Yelp and Foursquare might be the right choice. The market for most products nowadays is customer-centric, meaning consumers have access to a large amount of information when they are considering purchasing a product. If a small business can establish a social media presence and engage with prospects through it, revenue can increase amazingly. Sure a website will have some upfront costs, but if the owner updates it regularly, uses good SEO practices and drives traffic to the site through social media, the investment will pay off. Merchants don’t have to be designers or coders to get a great site. A local Google search usually will reveal area designers for hire. A website will help prospects find the business and probably encourage them to buy more. With a little more effort and depending on the product or service a small business is selling, an online store or ordering option could be a great way to expand into new markets. Restaurants can even partner with online reservation services that probably will have even greater reach. Businesses can thrive with a company website and social media accounts by focusing on engagement and analysis. Engagement can be a business owner answering questions on Twitter or Facebook. It also can be a blog post on the company website based on customer pain points. By analyzing website and social media traffic, businesses can figure out which marketing tactics are working best and how they can improve customer experiences. Being “follow worthy” should a primary goal of any small business, says Sujan Patel of Forbes Magazine. There are many tactics businesses can use to attract and retain followers on social media platforms, the challenge is find out which ones lead to conversions. Capitalism is great if you’re wealthy. Small-business owners often support politicians who are fiscally conservative thinking low taxes and deregulation sound great, but what the owners fail to see is economic benefits for the wealthiest citizens and businesses usually do not trickle down to middle-income citizens, as Paul Buchheit writes in Nation of Change. For a small-business owner to become wealthy, he can either win the lottery or expand his business. That probably will mean moving into a bigger building or opening multiple locations. The Internet can help with that by reducing costs. Cloud-based software, storage and services such as video conferencing are available and scalable, so businesses can add cloud services to their accounts as needed. Video conferencing allows business with employees in multiple locations to communicate more efficiently than through email, instant messages or even telephone. Corporations use this technology all the time, and thanks to BlueJeans and other companies, cloud-based video conferencing is affordable. 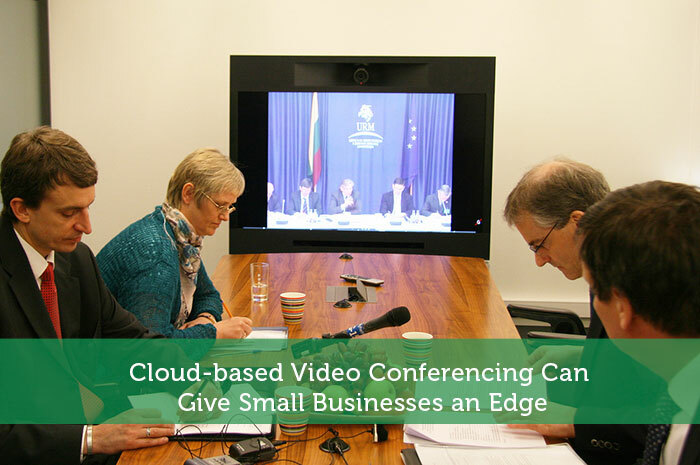 Small businesses don’t need expensively equipped video conference rooms with a cloud-based solution. Remote employees just need an Internet connection and a webcam. The technology has advanced to the point at which a video conferencing app downloaded to a cellphone can connect employees to a conference call from just about anywhere. Cloud-based data storage can save companies tons of money by eliminating the need for expensive local hardware. With cloud-based software, employees can access information from anywhere and work remotely. Small businesses can outsource just like corporations thanks to cloud technology. All of this reduces travel expense and save time. Business owners can use the extra capital to further expand operations or update current facilities to outperform the competition. If small businesses can continually expand and use new technology to their advantage, they can survive gentrification and maybe finally take advantage of all those tax breaks large corporations lobby to get.